just wants to see the world. 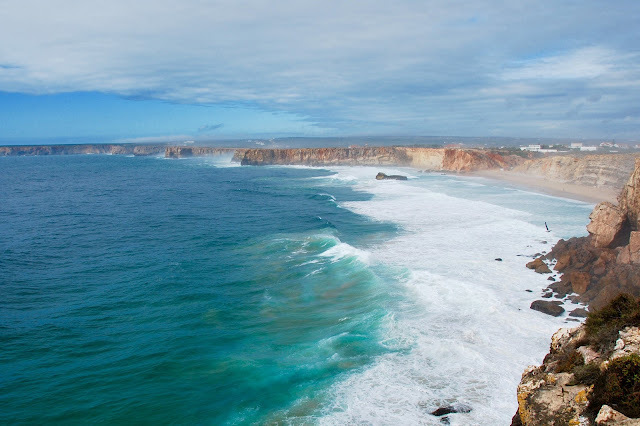 Next up on our Portugal itinerary was part of the southern coast of Portugal know as the Algarve region. 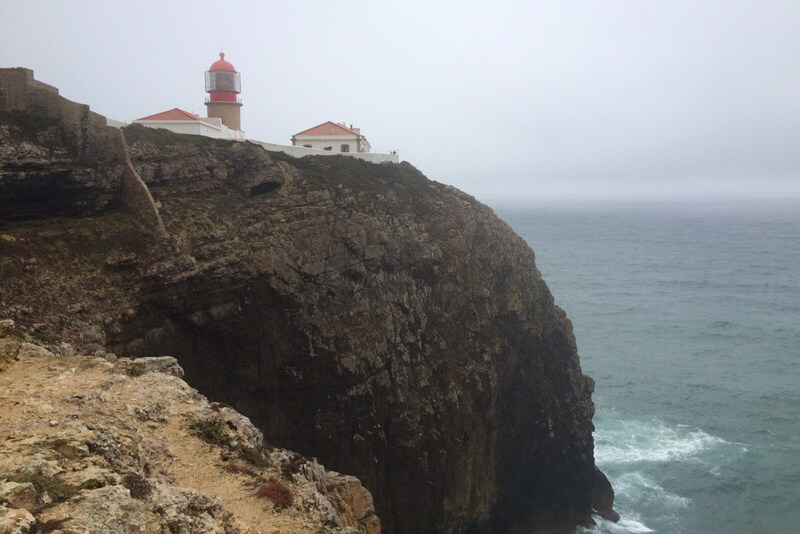 It's the most popular tourist destination in Portugal, so, of course, we debated long and hard on if we should go, as we tend to like off-the-beaten path places a bit more. 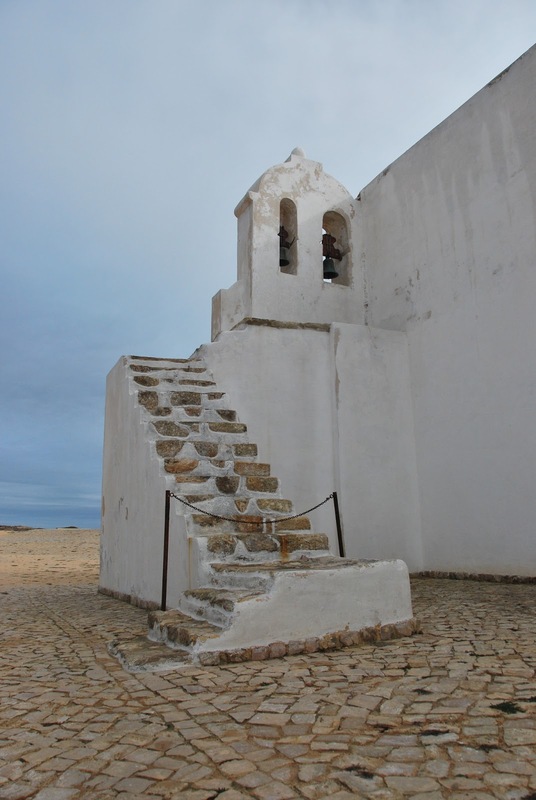 But, we were going slightly off season, and there's also a very Moroccan/African/Arabic influence in the Algarve, which we wanted to see. 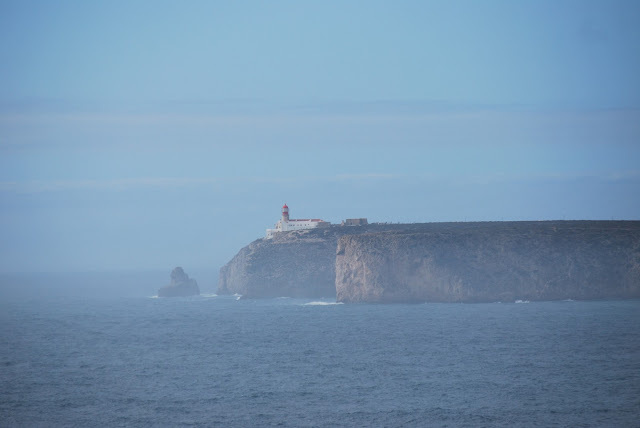 Plus, it boasts gorgeous beaches and coastlines, along with the first ever navigational school, Prince Henry's School of Navigation, in Sagres (established in 1418), so we ended up deciding to spend a few nights in the region. 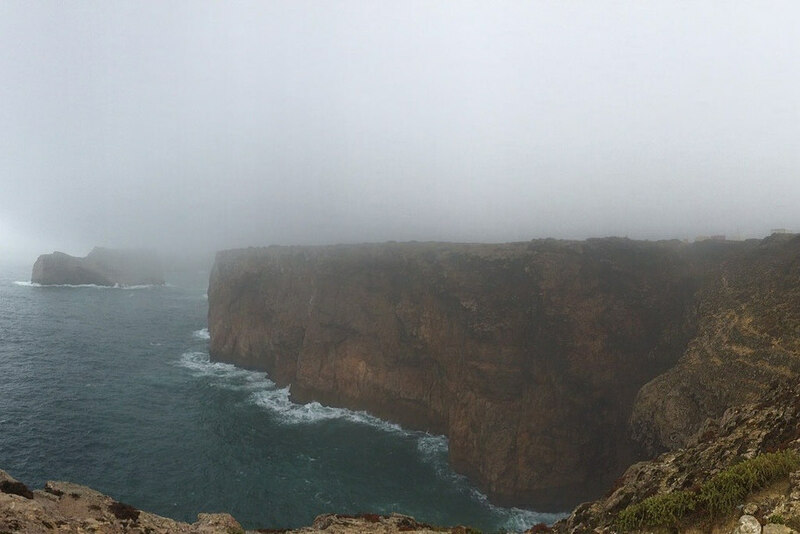 Panoramic view of the Sagres coastline. We rented a car in Lisbon and headed down to the Algarve. It took us a few hours once we got out of Lisbon, including a quick stop at a gas station for snacks. The drive is pretty straightforward - you pass some really lovely countryside along the way, with cork oak trees all over the place! We went straight to Lagos so we could check into our hotel. We decided to stay in Lagos because it had lots of options for hotels, and you could walk to some restaurants and bars. 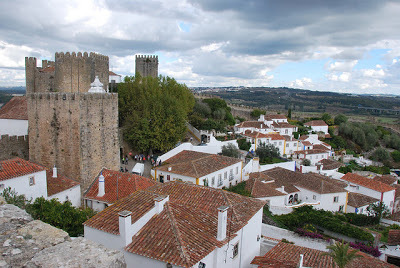 It's a smaller city, but one of the larger ones in the Algarve. 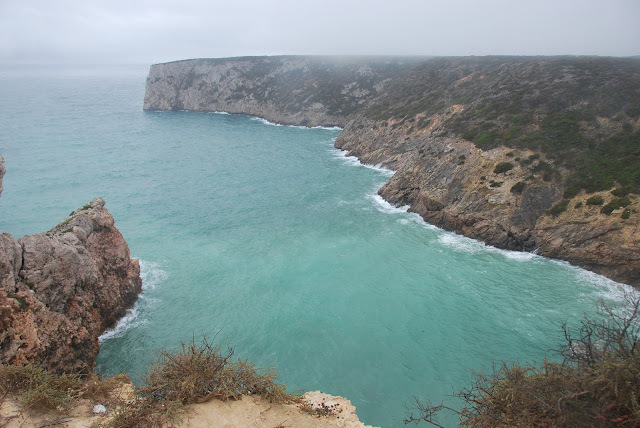 We ended up being happy we stayed there, since it had easy access to Sagres as well as Benagil, where we took a cave tour. 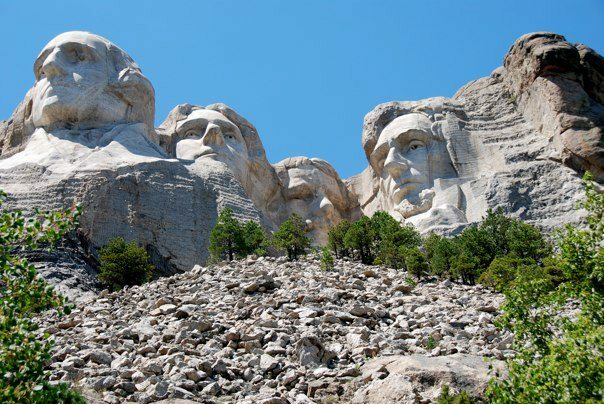 It was pretty central to what we wanted to do while we were on our trip. Once we'd checked into our hotel, we headed directly to Benagil for our cave tour with Taruga Tours (more on that HERE - it was a great tour!). After the tour, we went back to the hotel, then walked down to the main part of Lagos for dinner - we ate at one of the many restaurants along the main town road in a lovely outdoor patio. Some cheese, a bottle of Portuguese wine, and delicious entrees later and we were ready for bed! 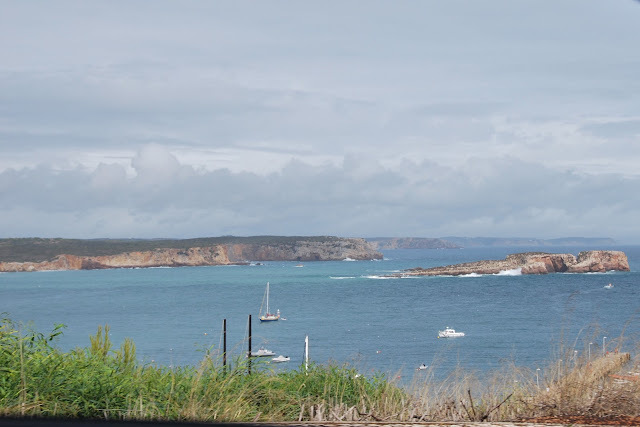 The following day was overcast and slightly rainy, so we ventured out in the car to do some sightseeing. 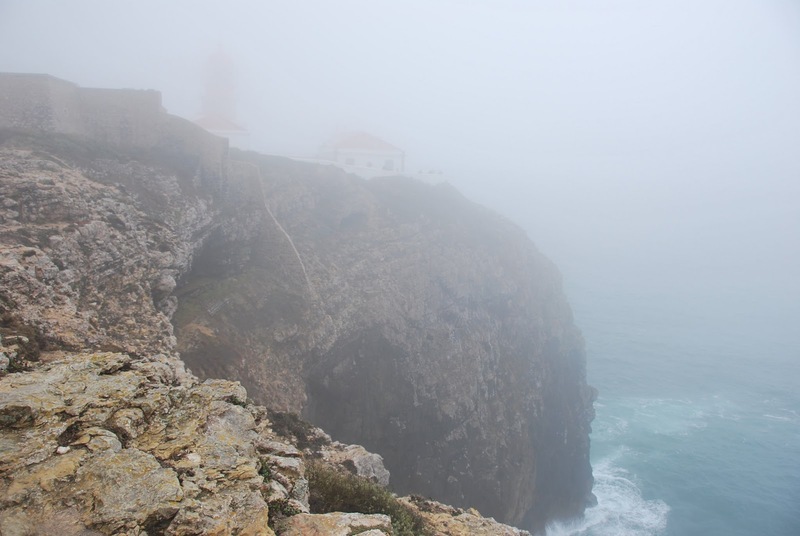 We drove out to Sagres, where we found the School of Navigation at the Fortaleza de Sagres, but the area was so socked in with fog that we couldn't see anything. We stopped for a coffee and a bite to eat for RW at this great little spot called The Hangout to plot our next move, and decided to drive out to the lighthouse at Cape Saint Vincent. There's not much out by the lighthouse, but it was worth checking out. They have a clean bathroom that costs about 0,50€ to use, two small shops, and a small museum that wasn't open when we went. It was still insanely cloudy when we arrived, but it was still a great visit wandering around the cliffs, and it started clearing up around midday. Cliffs and coves around the lighthouse. The fog made it obvious to why they put a lighthouse here! RW was daring enough to get all the way out on the cliff. It finally started to clear up a tiny bit so we could see more of the lighthouse. 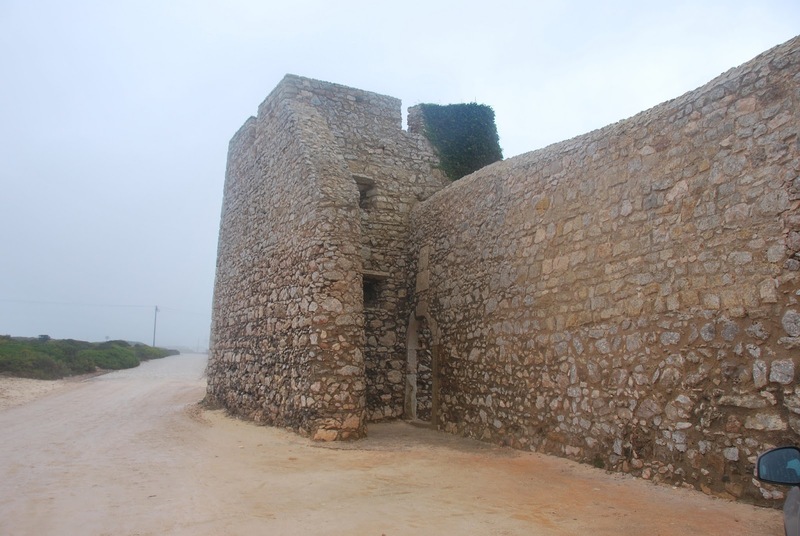 As we headed back to town, we noticed a small fort the fog had hidden from us on the way out - Fortaleza de Belixe - decided to stop. 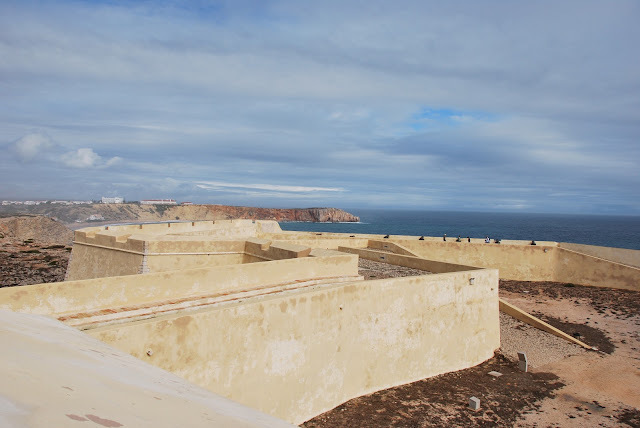 It was a quick stop as the interior of the fort is closed to the public due to it being unsafe and crumbling, but you could still wander around the outer grounds, and see some great views. 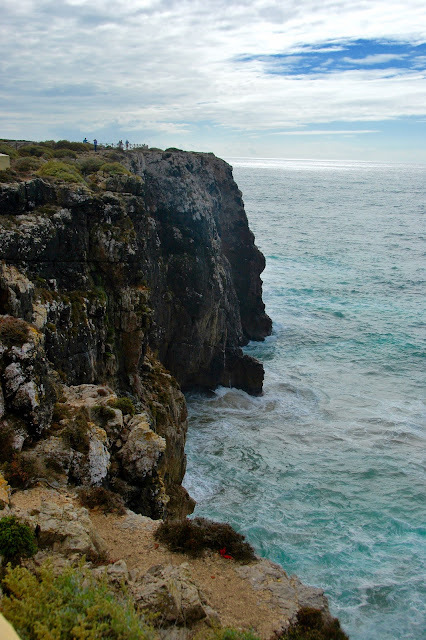 For the very daring - there's a path that goes part of the way down the cliff towards a cove. There were some old iron posts with loops at the top that seem like they possibly had a rope strung between them at one point that went the rest of the way down - we did not test out the footing on that part! The entrance to the fort. The coast off of the fortress and the gorgeous turquoise water! We headed back to Sagres town for lunch, and found a cute little place that I absolutely cannot recall the name of. The food was ok - not amazing, but not awful - which seemed like the standard in the town. Nothing screamed "gourmet" but everything was decent. View of the east side of the Sagres point. 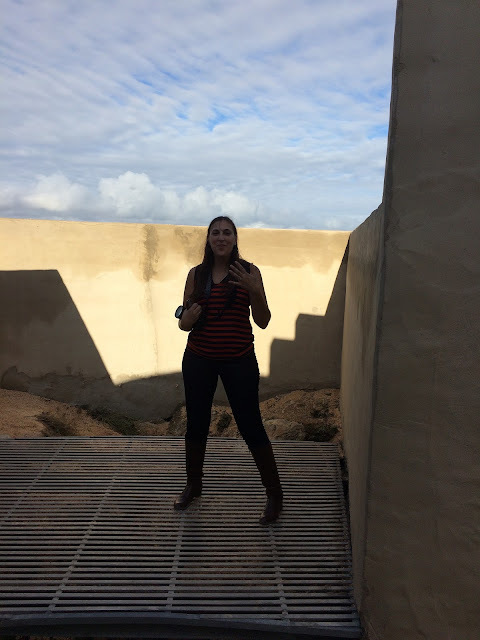 After lunch the sun was finally out, so we headed out to the Fortaleza de Sagres. Entrance was 3€ each, and there wasn't actually all that much to see, other than coastal views, a couple of wind vents from the caves underneath the cliffs, and a small church. The walls of the fort were kind of neat to see, and the views were very nice, but don't expect a full historic location. It has a nice walking path from the main area all the way out to the point along the coast, and if you have the time, it's a nice long walk with good views. 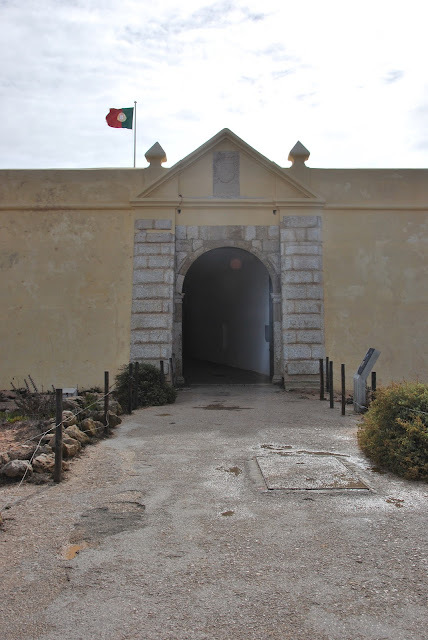 The fort is perfectly situated on the southernmost point of Portugal. View of the fort from one of the lookouts. Small church inside the fort. 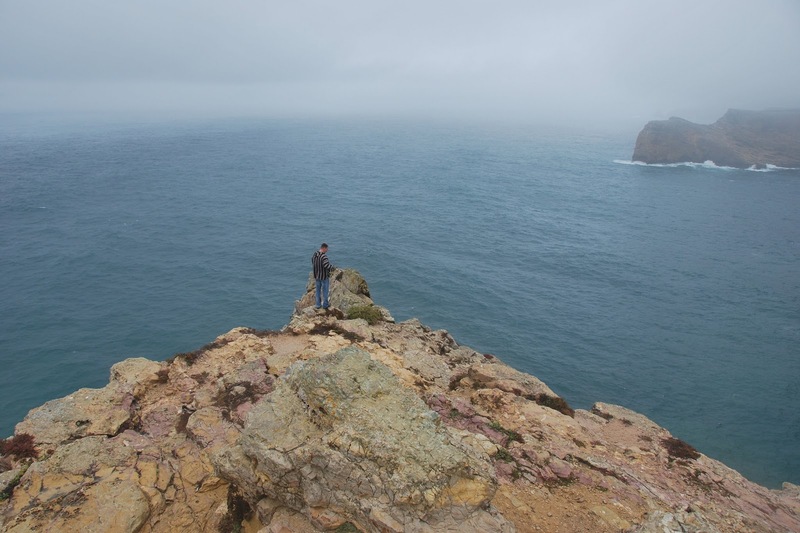 Stunning views of the cliffs and coast from the fort! You could even see the lighthouse at Cape Saint Vincent off in the distance. 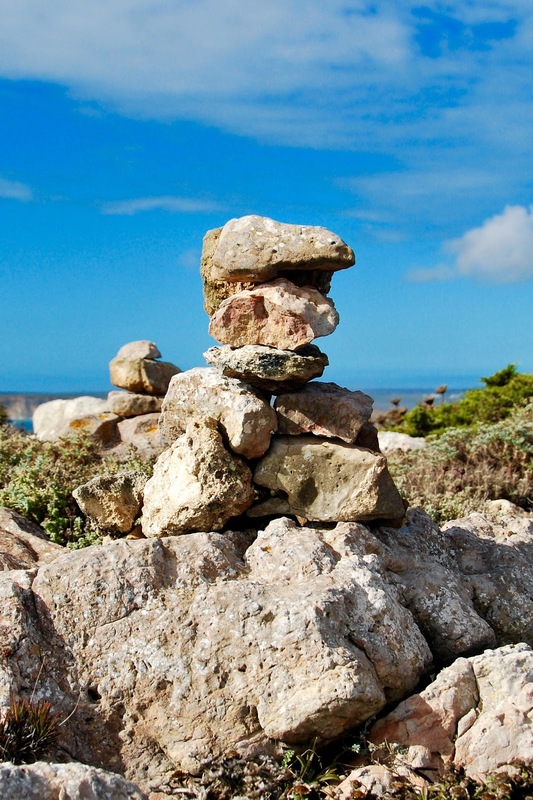 The middle of the fort's hiking area has tons of stones that people have stacked in formations. Walking along to the end of the point. 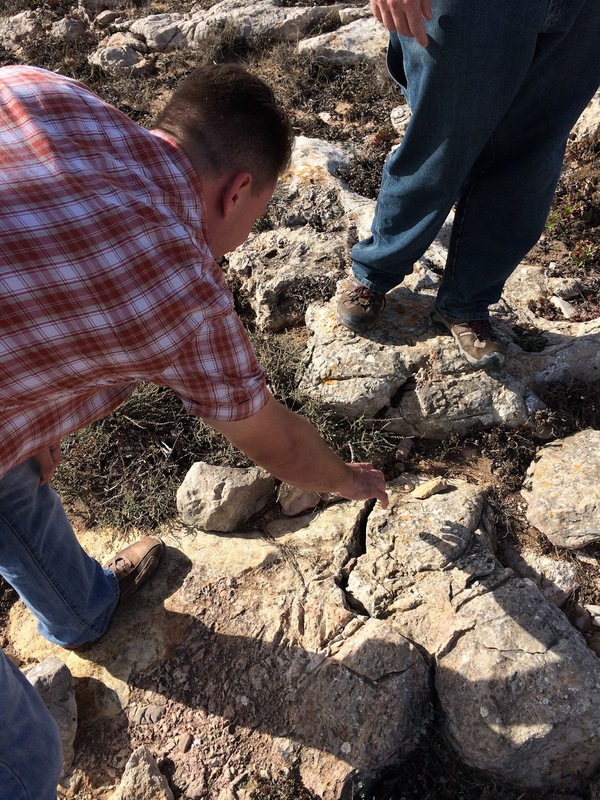 Hubby found another spot in the rocks where wind gusts came up from the sea caves below and we all nerded out about it! They have a structure near the end that has cool wind tunnels that come up from inside the sea caves to create gusts of wind when waves crash into the sea caves... you can walk out onto this one - it's slightly terrifying if you're afraid of heights, even though you can't see down into the cave... The wind that gusts up is pretty amazing though! 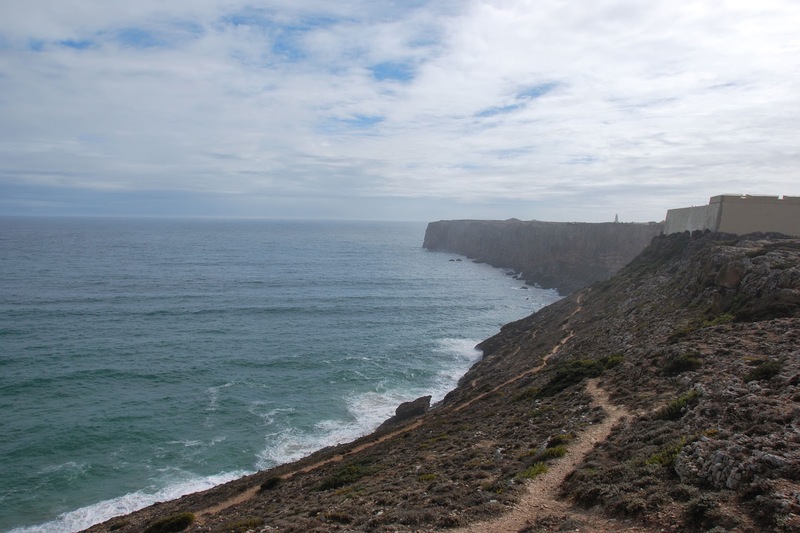 We noticed a bunch of surfers while we drove back towards Sagres, and Hubby is never one to miss checking the surf, so we made a quick stop at Praia do Beliche. There's a small parking lot there for the two cafes on the beach, so we stopped for a coffee (for me) and beers (for Hubby and RW) so that we could watch surfers try to catch waves and check out the sunset. The sun starting to set. Then it was back to Lagos for dinner and some barhopping, where we wrapped up our time in the Algarve at one of many Irish pubs in Lagos! Apparently, the Algarve is a huge spot for British and Irish ex-pats and vacationers - this worked out well for us as the boys were able to find properly pulled pints of Guinness! 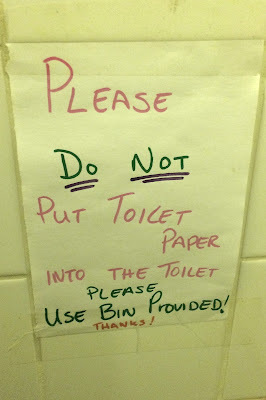 TRAVEL TIP: I've mentioned this before, I think, but we ran into several places in the Algarve where you are not allowed to throw anything (toilet paper included) into the toilets in public restaurants and bars and such. Many of the towns have sensitive plumbing - so keep an eye out for signs when you use restrooms - don't want to cause any plumbing issues! We quite enjoyed our exploring of the Algarve. 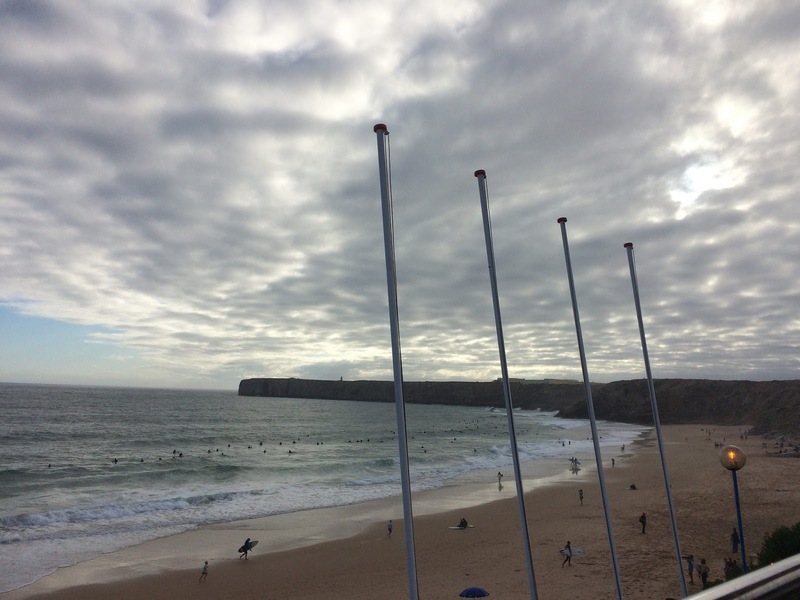 I'm not sure that when we return to Portugal we'll spend a lot of time there - we went in the off season, which we prefer to do in crowded beachy places. 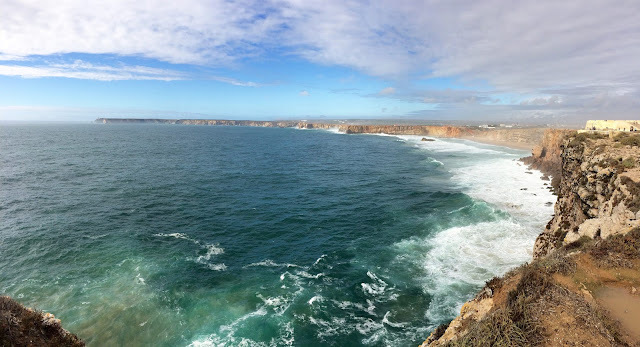 Also, the coast in the Algarve reminded us a lot of the central coast of California... it was kind of surprising how much! 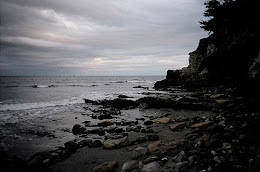 I'd love to go kayaking along the coast there sometime, but we saw most of what we wanted to see in our couple days. 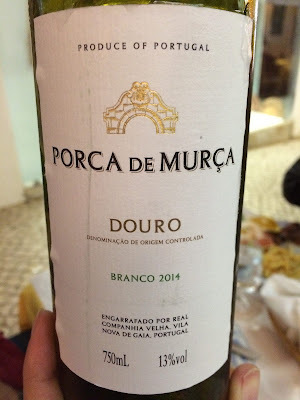 Check out more Portugal posts HERE! I'm Addy, and this is my blog. Otherwise known as a random collection of ramblings, articles, and photos about the travel I manage to squeeze in between my 9-5 job. I've recently made a resolution to travel more often, hopefully I'll be able to document that here! 1. I was born, raised, and live in Southern California and base all of my travel from the west coast. 2. LAX is my "home" airport. I love to fly and will fly just about any airline, except for Spirit Airlines. 3. Many of our trips include places near oceans, rivers, lakes, and we often go on boats due to a slight obsession with water. 4. 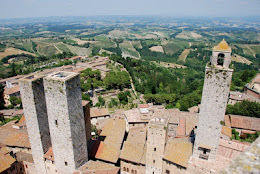 I am becoming more adventurous while traveling, and I prefer to not do touristy stuff 100% of the time. 5. I love Europe, the Americas, and the South Pacific. 6. I enjoy comfort, but am not necessarily "luxurious." 7. I search for the best deals I can find, but make sure I have enough money in my budget to splurge on occasion. 9. 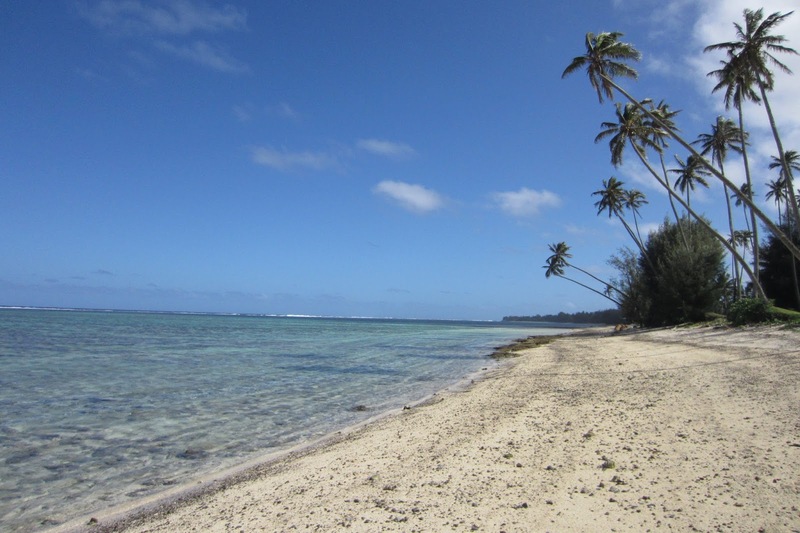 I am not a fan of hostels, or too much "roughing it." 10. I will try *almost* anything! Some of my favorite places!